Donor Members are forum members who have made a donation to the forum owner, Alan to help offset the substantial costs of running this forum which have escalated significantly with its increased popularity. 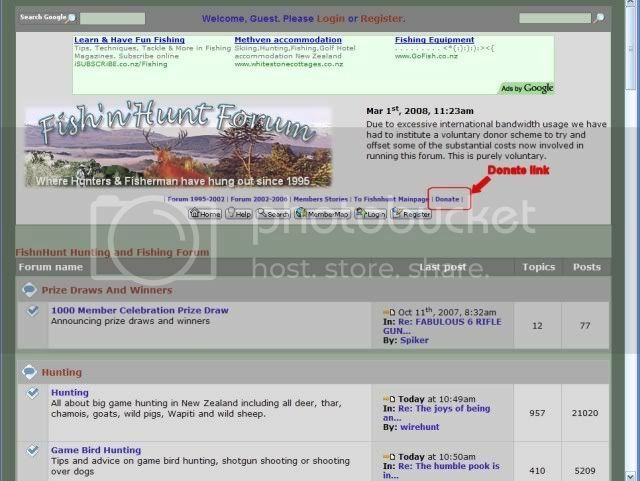 The FishnHunt forum has built up a substantial viewing audience all over the world and international bandwidth issues are starting to add a burden on the site costs. The alternatives were to restrict visitors or seek sponsorship for the forum. Members preferred to keep the forum with unrestricted viewing and to resist corporate sponsorship allowing the forum members to express and discuss views openly without having to account for sponsors' sensitivities. Therefore most members preferred to be able to donate a small fee to assist with the running costs. The discussion on the forum funding issue can be read in this thread. Donations are voluntary and very welcome - if you choose not to donate you will not be disadvantaged in any way. As a Donor Member you gain access to a special "Donor Forum" for in-house discussions and other forums such as Computer advice and ask a Vet. If you would like to make a donation, click on the Donate link at the top of the page (see image below) or go to this page where there are several options available for payment.